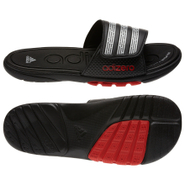 Adidas - Soft flexible and quick-drying these adidas Proveto 2.0 Slides feature a comfortable EVA footbed and non-absorbent bandage upper for easy wear in both wet and dry conditions. 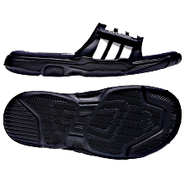 Adidas - Calo 3 Slides Your favorite beach thong gets the latest and greatest in casual comfortable vibes. The adidas Calo 3 is styled for good looks and brings plenty of EVA comfort to your day. 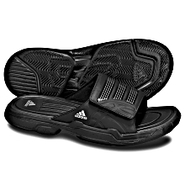 Adidas - Duramo Slides For post-game casual wear the adidas Duramo Slide deserves a spot in your gear. It's designed to deliver comfort with lightweight EVA cushioning and an easy style. 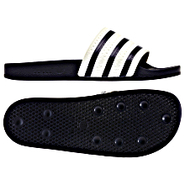 Adidas - Calo Leather Slides Radiate a cool California vibe everywhere you go in this lightweight thong. 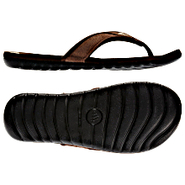 Leather straps take the look a step above while the outsole is designed for comfort and style. 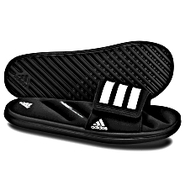 Adidas - adilette Slides Keeping feet laid-back and happy since 1972 the adidas adilette is the most famous sport slide out there. 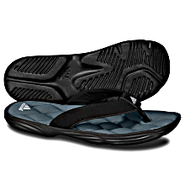 This comfortable slip-on style features a durable and quick-drying synthetic upper textile lining and contoured footbed. 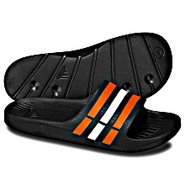 Adidas - The classic slide returns. 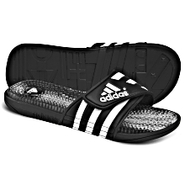 Super comfortable super sporty these adidas Alquo Vario Slides feature a textured footbed an adjustable upper and a quick-dry bandage lining. Perfect from home to the locker room. 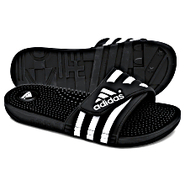 Adidas - The legendary slip-on comfort of the adidas adilette Slides returns with a fresh color update. 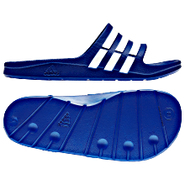 These slides feature a durable quick-drying upper and a comfortable contoured footbed. 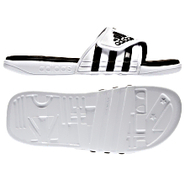 Adidas - adissage Slides A clean sporty slide that cuts out the frills and goes straight for the aah! 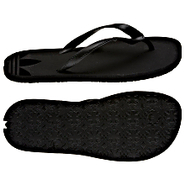 An adjustable strap gives you quick-fit comfort and the full-length massage footbed makes your feet feel great. 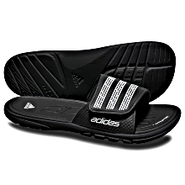 Adidas - Calissage Slides A soothing after-sport slide with soft EVA outsole and massage footbed. 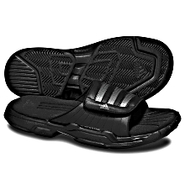 The upper is adjustable to fit your feet making it that much more comfortable. 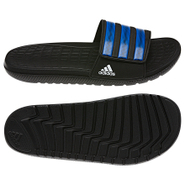 Adidas - Chayassage Slides Treat your feet to premiere post-sport creature comfort. The adjustable strap makes the switch from bare feet to socks a sure-footed transition. 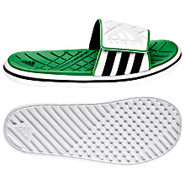 Adidas - Santiossage Slides What to wear when you're finished wearing the other team thin. 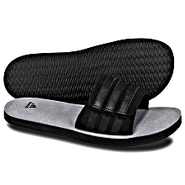 A massage slide that gives your feet a great fit and extra pampering. 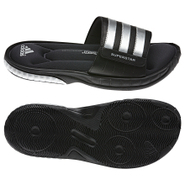 Adidas - adiLight SUPERCLOUD Slides In the shower at the pool or just running out to get the mail these adiLight SUPERCLOUD(tm) slides by adidas feature a comfortable quick-drying footbed an easy single-strap upper and soft EVA cushioning. 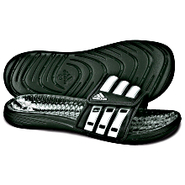 Adidas - As comfortable as they look. These adidas Koplane QFF Slides feature a new quilted FitFOAM(tm) footbed that feels like you're walking on pillows. 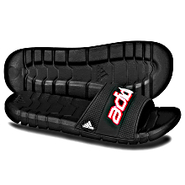 They feature puffy padded straps for added comfort. 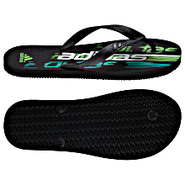 Adidas - Adissage UF+ Slides Sensitive feet? The new adidas adissage UF+ is the ultimate in comfort. 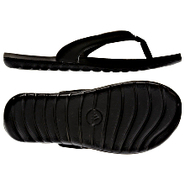 Super-soft UltraFOAM+ offers incredibly plush cushioning in a shower-friendly footbed. 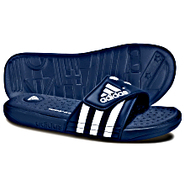 Adidas - With their luxurious leather build these adidas Kosail Slides slip you into leisure time. 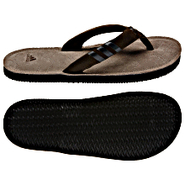 They feature padded leather straps and a suede footbed for easy slip-on comfort. 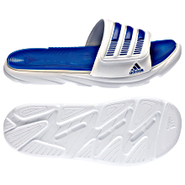 Adidas - SS 2G Slides Plus Get aggressive about comfort. 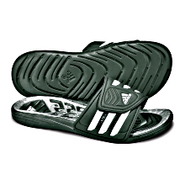 The adidas SS 2G Slide Plus sports a FitFOAM(tm) footbed that molds to the contours of your foot while the 3-Stripes upper has adjustable pull tabs to help you further personalize your comfort zone. 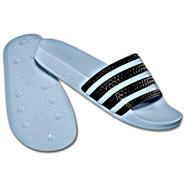 Adidas - SS 2G Slides Imagine your favorite pair of Superstars got together with your favorite pair of slides and had a child. It would have the iconic toe cap of the Superstars and the super-cushy fitFOAM(r) footbed of the slides. It could happen.